Step 1 – Your bets can vary anywhere between 1p and 50p per play, but beyond that it is entirely up to you how much you want to lay down per game. The change bet button allows you to decide. 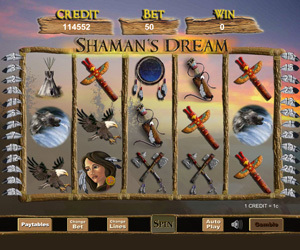 Step 2 – There are a total of 25 pay lines spread over five reels in Shaman's Dream slots. To change how many pay lines you currently wish to be playing with, don't hesitate to click on the pay lines button at the bottom of the screen to activate or deactivate pay lines to your pleasure. Step 3 – When you're all set up, it's time to hit that beautifully crafted gamble button in the bottom right corner of the screen. As with nearly all slot machine games, anything you win will be highlighted to you along the pay line selected, and will be added to your balance. Shaman's Dream slot machine has been skilfully crafted by some fine designers. Taking on the theme of cowboys and Indians, this Pocahontas-esque game features some of your most traditional or stereotypical characters from the genre. The Shaman's Dream game has beautifully rendered wigwams, totem poles, relics, bald eagles, wolves, tomahawks and more native American Indian imagery painted over its reels to really capture the mood and setting of the game. The dream-catcher icons is of course your scatter card, and nailing a few of these on your reels will only help you on your way to multiplying your winnings. If you want the Shaman's Dream Slots big jackpot you'll need to hunt down five wolves, which generally coughs up about nine and half thousand coins. That's a rather sizable fortune when it's converted into real dough! Oddly enough, the attractive graphic that is presumably Pocahontas, surprisingly isn't worth very many coins at all!